post-pilgrimage two | doberman pizza. Feeling better now, and getting back into the swing of things. I’ve got less laundry lying around, the jetlag has mostly faded, and work is getting back on track. Keeping alive the conscious contact with God is a challenge when there are so many things around to steal away your energy—the effect of messy, disorganized environment has begun to dawn on me quite clearly. So, ok, doing laundry is one step, but managing my time is another thing that saps a lot of my energy right now. I haven’t yet found one reliable way to manage my time that allows me to efficiently and consistently juggle all the different things going on in my life. Which reminds me: another step I would like to take is to rewrite the set of rules by which I carry new ideas to action. In the past, my pattern has been to impulsively jump on new projects that look interesting (shiny objects, anyone?) I’d like to adopt a new pattern, in which I run all these new ideas through a set of reality checks to weed out the projects that will obviously never get done. Hopefully, something like this would help me maintain focus on those important things that are most necessary in day-to-day life and those that are (hopefully) most aligned with the Will of God. There’s been more prayer and meditation in my life lately, and my mood has improved, which is good. I feel like I’ve learned how to pray through being so close to the Holy Shrines and asking for help at the Sacred Thresholds. Attaining to the Presence of the Báb, Bahá’u’lláh, and ‘Abdul-Bahá was such a powerful experience—I feel like it’s left its mark on my soul, or at least I fervently hope it has. I hope that by the grace of God, I may be enabled to continue turning my will over to His day by day, one day at a time. The grace of God is something I want to share about with you all—but that’ll have to wait for another night. Stay tuned and keep checking out the new pilgrimage photos on flickr. Also check out Maruška’s livejournal for another view of our pilgrimage from a fellow “Port Inner“. 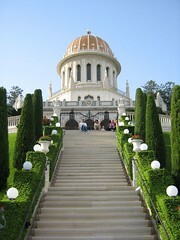 This entry was posted in baha'i blog, by the way..., journal and tagged photos, pilgrimage, reflections by danger. Bookmark the permalink.